Easy chocolate Oreo cake recipe from scratch filled with Oreo buttercream frosting and topped off with chocolate ganache. Perfect soft, moist birthday cake! This EASY Oreo cake recipe is one of my son’s favorite cakes, which he even requested for his last birthday. Now, I have seen a variety of Oreo BIRTHDAY cakes but this is my creative spin on it. 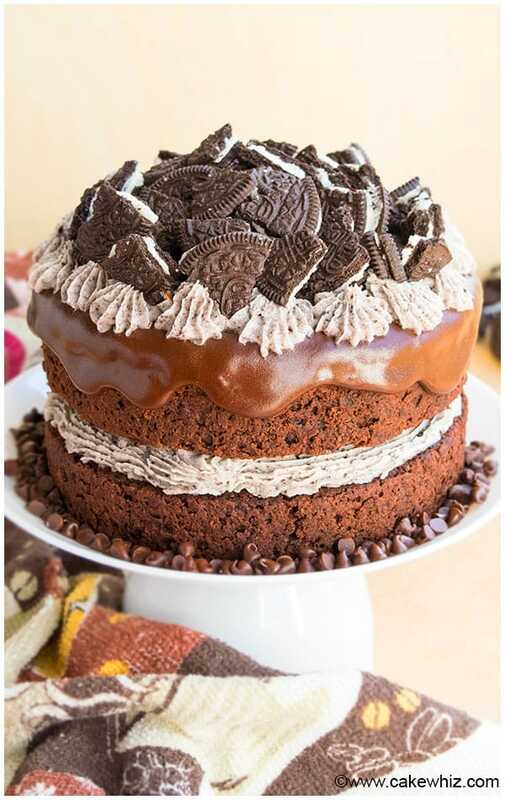 The Oreo cake filling in this cake is to die for… I swear I can eat it by the spoonfuls! lol. It’s SMOOTH and CREAMY and packed with that wonderful Oreo cookie flavor. Overall, this naked layer cake is SOFT and very MOIST. DON’T replace oil with butter in the cake since that will change the texture dramatically and make it dense. DON’T replace buttermilk with regular milk or vegan milk because that would change the texture of the cake. Instead of making your own Oreo cookie crumbs, just BUY them because that will be easier and quicker. If your icing is too thin, THICKEN it with more powdered sugar. If it is too thick, THIN it with additional milk or heavy cream. Use the best quality of cocoa powder in the cake and best quality of chocolate for the ganache. To PREVENT the Oreo cookie decorations on top of the cake from becoming soggy, add them just prior to serving. The number of servings you get from this recipe will VARY, depending on how thick or thin you like your slices. For vanilla Oreo cake recipe, replace Oreo buttercream frosting with my classic American buttercream frosting OR Cooked flour buttercream (Ermine frosting). For Oreo cake recipe with cake mix, make the cake according to the box instructions. Then, cut it in half and fill it with my Oreo frosting. Also, cover the entire cake with this frosting. Then, top it off with ganache and chopped Oreos. For Oreo pudding cake, I suggest making a poke cake. Prepare the chocolate cake in a rectangle cake pan instead of circle pans. The, poke holes throughout the cake with a bubble tea straw. Prepare instant pudding mixture and pour it over the cake. Allow the cake to set in the fridge and top it off with frosting or whipped cream. For Oreo cake recipe (no bake), I would suggest making an ice box cake with layers of whipped cream or ice cream and Oreo cookies. 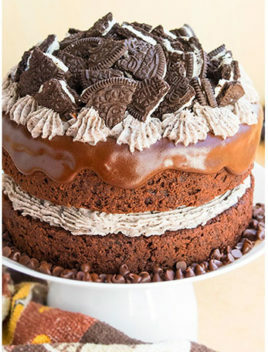 How do you make an Oreo cake? 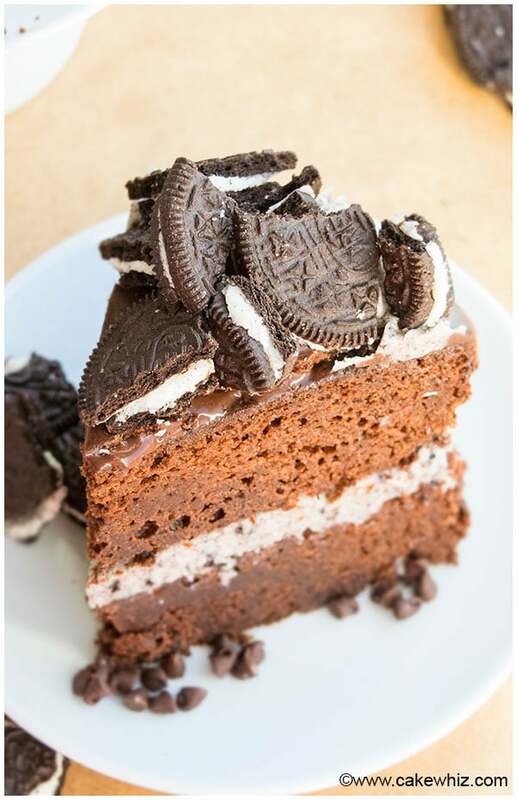 How to make Oreo cake step by step? 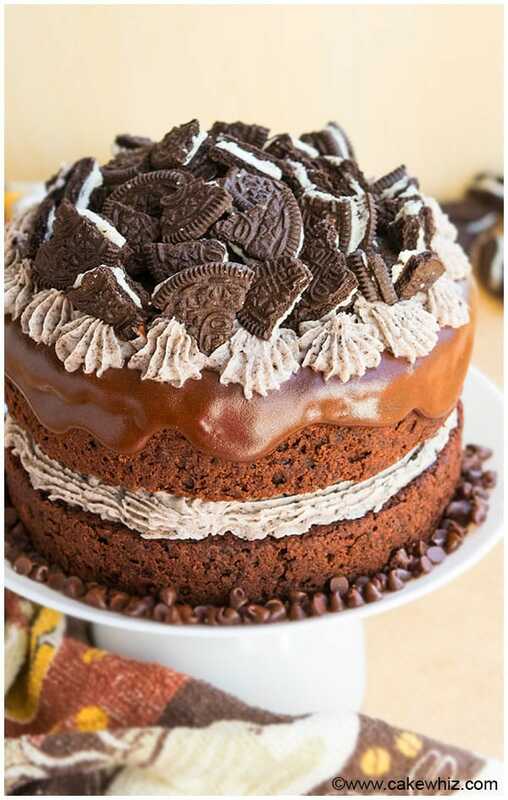 An Oreo cake is made by preparing the chocolate cake first. Once the cake cools down, it’s filled and frosted entirely with Oreo frosting. Finally, it’s topped with chocolate ganache and decorated with roughly chopped Oreos. The step by step instructions and recipe can be seen and printed below. In a mixing bowl, add eggs, oil, vanilla extract, buttermilk, water and mix everything until fluffy. In a separate bowl, whisk together the flour, sugar, cocoa powder, baking powder and baking soda. Dump this dry mixture into the wet mixture and mix until just combined. Do not over-mix! Pour batter into 2 round cake pans (Dimensions: 8x2). Bake at 325 degrees for about 40 minutes or until an inserted toothpick comes out clean. Let the cakes cool down completely. In a mixing bowl, cream together butter and shortening. Add powdered sugar slowly and continue mixing. Add Oreo crumbs slowly and continue mixing. Add milk or heavy cream (1 tbsp at a time) until frosting is smooth and creamy. In a microwave- safe bowl, melt chocolate in 30 second increments. Add heavy cream and mix until smooth. Once the cakes have fully cooled down, cut the domes and make them flat. Place one cake on a cake stand and top it off with Oreo frosting. Place the other cake on top of the frosting and gently press it down . Cover the entire cake with frosting, if you like (Optional). Pour ganache on top of the cake and use a spatula to spread it out until it starts dripping along the sides. Prior to serving, pipe some frosting on top of the ganache and decorate the cake with chopped Oreos and enjoy! At first I couldn’t believe this would actually be easy just because of how darn pretty it is- but you weren’t lying! This one’s definitely getting pinned for later!